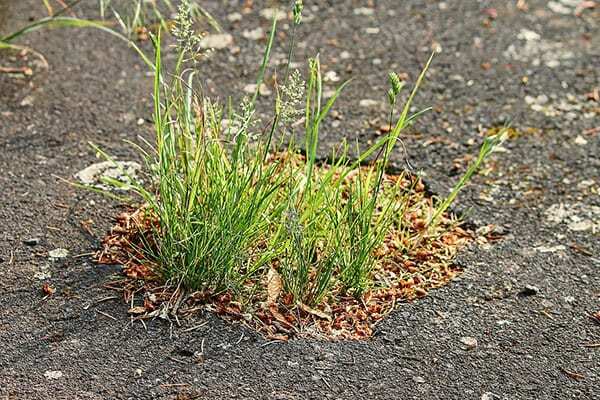 When weeds start growing in cracks and potholes, damage to the pavement will continue to worsen until the area has been cleaned and patched. 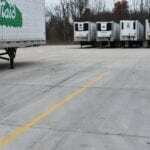 When an asphalt or concrete parking lot beings to crack because of overloading, heightened material stresses, and/or oxidation, it’s only a matter of time before that crack becomes a pothole. For that reason, it’s always in the best interest of business/property owners in Cleveland to get any visible cracks sealed as quickly as possible. When a crack is not addressed, the same material stresses that caused the crack will likely continue to exploit the area and both deepen and widen the crack. Further, moisture will find it’s way into the depths of the crack, accelerating the rate of oxidation and causing strain as that moisture freezes during Northeast Ohio’s vicious winter months. Deeper sections of a pavement sustaining these damages will be unable to adequately support the weight of oncoming traffic. Eventually, these pressures culminate into adjoining cracks that continuously dislodge chunks of asphalt or collapse under the weight of traffic, thus creating the potholes that drivers loathe. A pothole that does not extend more than an 1.5″ into a pavement can usually be repaired with a simple patch job by your local paving company. The patching process is simply laying a tack coat, a material that provides increased adherence, and then laying new asphalt or concrete into the gap. Then the asphalt is compacted, allowed to cure, and finally the edges of the pothole are sealed to prevent water penetration at the seams. Many people try to use DIY methods such as cold mix asphalt patches bought from a local hardware store. While these solutions do address the problem for a short time, it is still a temporary, inferior alternative to using hot-mix asphalt with a professional paving company. 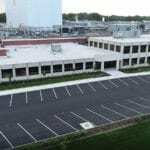 Some companies use infrared heat to bring asphalt to its original, permeable state and use an asphalt rake with a combination of new asphalt to restore the integrity of the surface, without creating vulnerable edges that appear with traditional asphalt patches. Ohio Paving & Construction does not offer infrared repair technology at this time. We treat any pothole that reaches beyond the surface layer but not yet into the sub-base, usually 2-3″ in depth, with a partial-depth repair. This requires milling the failing area, grinding to the appropriate depth, and laying new hot mix asphalt layers in the problem area. When the sub-base is damaged, or there is excessive alligator cracking, (indicative of base failure) the only lasting solution is for Ohio Paving & Construction to provide a full-depth repair. This process includes saw-cutting the affected area for removal, and then re-building the pavement from the bottom up. Remember to let any asphalt repair job dry for a minimum of 24 hours before allowing contact with people, pets, or traffic. 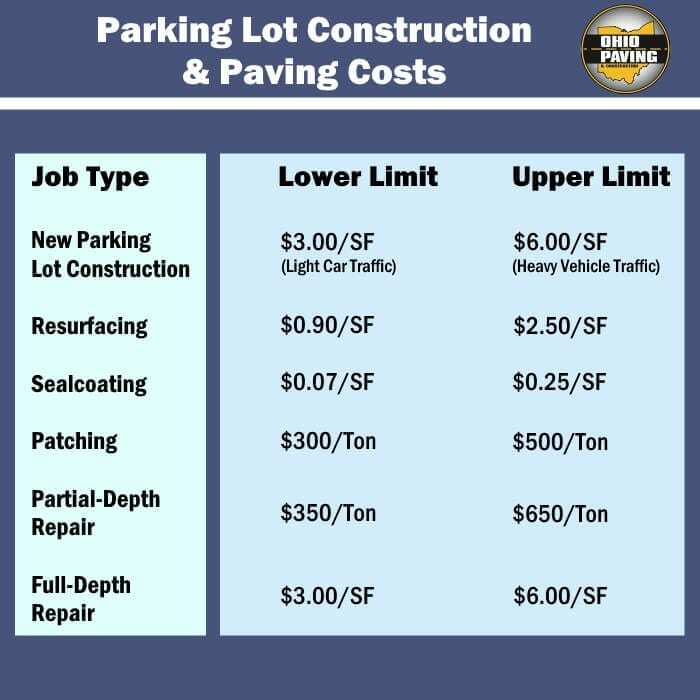 Below are our price ranges for asphalt repair jobs. For details on concrete repair, please contact us. Patching: $300 to $500 per ton. Full-Depth Repair: $3.00 to $6.00 per square foot. The amount of time/effort is necessary for cleaning. An asphalt or concrete pothole must be free of vegetation, dirt and debris before our team can repair the area.